Sydney Swans star Lance Franklin soaking up a special moment with Swans Head Doctor Dr Tom Cross. He’s a giant of this game and sport in general. He’s one of the best athletes I have ever seen in my life. To have him at the opening with his amazing wife Jesinta, and to have ‘Buddy’s’ sister Bianca there – I couldn’t have hoped for anything more special. 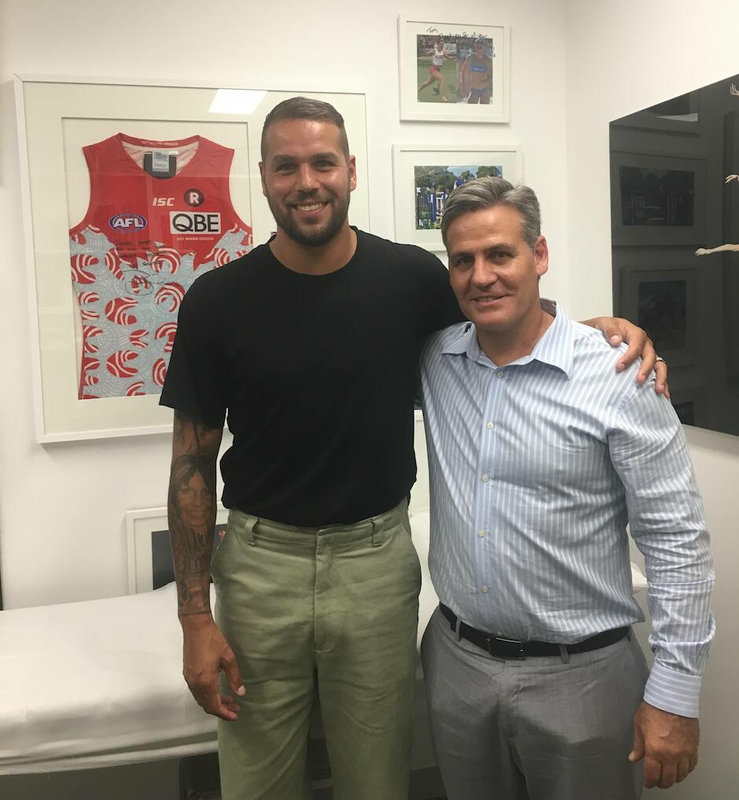 Star Sydney Swans forward Lance Franklin this week opened the club’s official doctor’s clinic in the heart of Moore Park. The Stadium Clinic has played a central role in getting Sydney’s players on the ground week in and week out since being founded at Moore Park in 2008, but the rebuild of Allianz Stadium has seen the practice relocate to the Byron Kennedy Hall in the Entertainment Quarter. A beautiful, theatre-like, heritage-listed building dating back to 1924, the Byron Kennedy Hall hosted more than 200 guests as Franklin opened the clinic on Tuesday night. Swans Head Doctor Tom Cross said Franklin welcomed the opportunity to open the clinic from the moment he asked him, and he told Swans Media having the four-time Coleman Medallist do the honours meant a lot. “It was very, very poignant and special,” Dr Cross said. The entrance of the clinic. Sydney Swans chairman Andrew Pridham (left) and veteran Swans defender Nick Smith (middle) catch up at the opening of the clinic. Sydney Swans Football Operations Manager Peter Berbakov and Swans Head of Development John Blakey enjoying a chat. The 2004 Sydney Swans guernsey looking immaculate in the clinic. Star Sydney Swans forward Lance Franklin addressing the 200-plus guests. Franklin cuts a red ribbon to officially open the clinic. From left: Lance's sister Bianca, Lance's wife Jesinta, Dr Tom Cross' father Dr Mervyn Cross OAM, Lance, Dr Cross' mother Virginia and Dr Cross. Franklin and Dr Cross sharing a special moment. And the plaque dedicated in tribute to Franklin, which has been installed on a wall within the clinic.